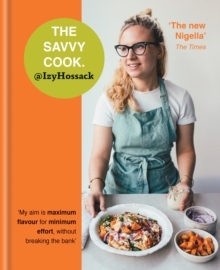 'The new Nigella' - The Times'My aim is maximum flavour for minimum effort, without breaking the bank' - Izy HossackFor those cooking for themselves for the first time, or for anyone who wants the weekly budget to go a bit further without sacrificing flavour, cooking sensation Izy Hossack has all the answers. With features that include menu plans, clever alternatives to meat and giving last-night's leftovers a makeover, The Savvy Cook is full of more than 160 nourishing and totally delicious vegetarian recipes that will be kind to your body, wallet and free-time. It's not about health fads, 'antioxidants' or obscure ingredients. Just honest, nourishing and delicious cooking that will make you glow inside and out!Recipes include Berry Oat Smoothie Boxes, Ricotta Gnocchi with Pesto & Courgettes, Lazy Potato Hash and Lemon Blueberry Drizzle Cake. Each recipe also contains a key, making it easy to spot the vegan, dairy- and gluten-free options. From healthy breakfasts to warming suppers, delicious sweet treats to snacks for sharing, Izy shares her favourite recipes that will make cooking easy for the new cook operating on a tight budget and busy schedule.